The Development of Protection From Above. 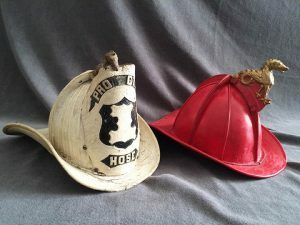 The earliest fire helmets were merely “stove pipe” hats with designs painted on the front, often showing the name of the fire company to which the wearer belonged. Made of a rigid leather material, they didn’t actually provide much in the way of safety. A “stove pipe” firefighters hat (not in CFFM collection). 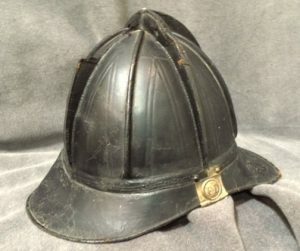 What we think of today as the “traditional” fire helmet was first developed by a volunteer firefighter, Henry T. Gratacap, in New York City, sometime between 1821 and 1836. It was made from a tough leather sewn together in sections. 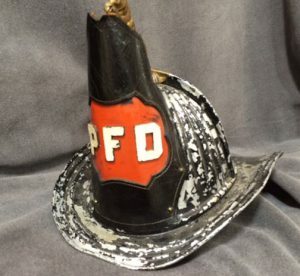 Fully functional, with a reinforced dome used to protect the firefighter from falling objects, this helmet was a huge leap forward from the previous top hat affairs. The original design had four “combs” (raised seams), crossing the helmet in both directions, but through usage it was found that the more combs a helmet had, the stronger it became, so helmets were later produced with eight, twelve and sixteen combs. This new helmet design, thereafter known as the “New York” style, featured many innovations: the tall, hard leather front shield was designed to break windows for rescues, and also provided ventilation. The protruding rear brim protected the back of the firefighters neck from intense heat and scorching water. If turned back to front it could be used to protect the firefighter from heat, water, rain or snow if he put his chin down to his chest. Another use was as a signal — a helmet thrown out of a window became the universal sign of a firefighter in distress. Early leather helmet probably used as a parade helmet. Prominent helmet badge on a metal helmet. A short time after Gratacap began his helmet production, two brothers, the Cairns, had the idea of adding identification badges to the front of their helmets. Shaped wide near the brim of the helmet and ending in a point at the top, often with a brass eagle or other device to connect the dome and hold the shield in place. The brass eagle was most popular in the USA where it is said that an unknown sculptor created a figure on a volunteer firefighter’s grave, at the Trinity Churchyard in Manhattan, which depicted a firefighter emerging from flames holding a trumpet in one hand and a sleeping child in the other. There was an eagle on his helmet. Since then, and even despite studies which showed the brass eagle hindered firefighters by becoming entangled and often got knocked off or dented, firefighters continued to wear the eagle on their helmets. In Canada, shield holders were sometimes lions, beavers or seahorses. Two vintage leather helmets each with the rare seahorse badge holder. White helmet would be for a Fire Chief. There is a colour tradition associated with fire helmets, the colour being used to highlight officers: Chiefs wore a completely white helmet; Captains and lieutenants wore helmets with a white front and a black or red back; firefighters who were were part of “engine” companies wore black helmets, and red helmets were for “ladder” companies. Much later, when rescue companies were formed, they adopted blue helmets. With the advent of fire helmet shields, pictures with the department names became common and helped with further identification of the individual. Symbols, like the bugle, became the accepted sign of an officer of an engine company. Pick axes became the sign of an officer of a ladder company. The fire department “scramble”, was worn by the rank and file and consisted of an image of a helmet, ladder, pike pole, and an axe in a circle. In recent times, many firefighters wear yellow helmets for visibility. As well as being made from more durable materials, changes in modern helmets include visors or eye shields added as well as earflaps and cloth mechanisms to keep the inside of the helmet from resting on top of the firefighter’s head. The Canadian Fire Fighters Museum has a wide range of fire helmet specimens from almost every era.